USS Shoup’s (DDG 86) visit, board, search, and seizure team members board Motor Vessel 26 Agustos to conduct a safety sweep following a suspected pirate attack Nov. 27. Shoup is attached to Combined Task Force (CTF) 151 operating in support of counter-piracy and maritime security operations. (Photo: US Navy). USS Shoup (DDG 86) assisted Merchant Vessel 26 Agustos today following an unsuccessful attack by suspected pirates late Saturday evening. 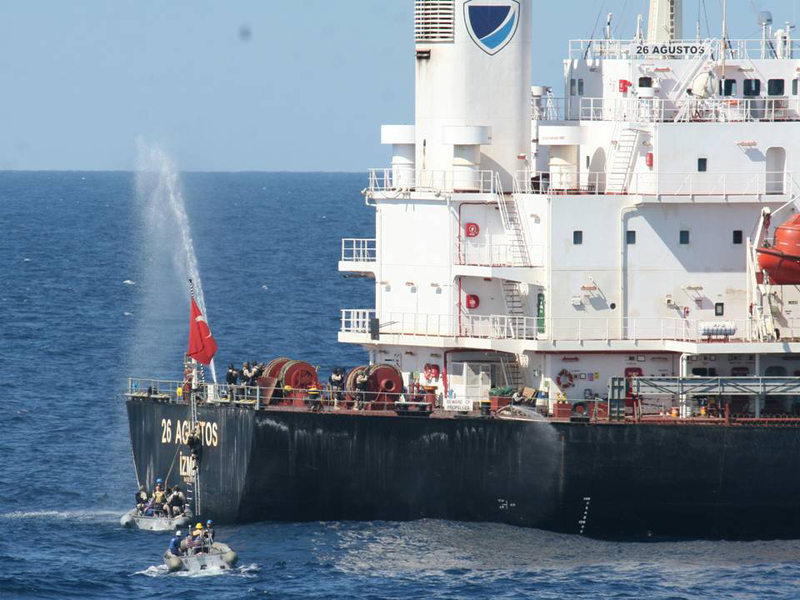 MV 26 Agustos reported to the UK Maritime Trade Organization that it was under a possible pirate attack. The crew locked themselves securely in the engine room, where they retained control of the ship and were out of reach from the suspected pirates. The Turkish-flagged cargo ship was en route from Romania to Bangladesh when the attempted pirate attack occurred, north east of the island of Socotra in the Arabian Sea. Shoup was immediately dispatched by multi-national, Combined Task Force (CTF) 151 to investigate. Upon arriving in the vicinity of Agustos, Shoup launched a helicopter to undertake aerial reconnaissance. The pirates, having failed to take control of Agustos and its crew, disembarked prior to the Shoup’s arrival. A Vessel Board Search Seizure (VBSS) team from Shoup boarded Agustos and confirmed the pirates had left and the crew was safe and unharmed. Agustos then resumed its original journey. CTF-151 was established in January 2009 as a multi-national counter-piracy task force. In the last few months it has included ships from Australia, Pakistan, Singapore, Republic of Korea, Thailand, Turkey, the UK and U.S. Together with EU Naval Force and NATO, ships from CTF-151 patrol in the Somali Basin and in the Internationally Recommended Transit Corridor (IRTC) in the Gulf of Aden. CTF-151 is one of three task forces operated by Combined Maritime Forces (CMF), a global maritime partnership, dedicated to promoting security and prosperity across some 2.5 million square miles (6.5 square kilometers) of international waters in the Middle East. CMF’s main focus areas are countering terrorism, preventing piracy, reducing illegal activities, and promoting a safe maritime environment.